Oil. The outer layer of the tear film, produced by small glands on the edge of your eyelids (meibomian glands), contains fatty oils called lipids. These smooth the tear surface and slow evaporation of the middle watery layer. If your oil glands don't produce enough oil, the watery layer evaporates too quickly, causing dry eyes. Dry eyes are common in people whose meibomian glands are clogged. Meibomian dysfunction is more common in people with inflammation along the edge of their eyelids (blepharitis), rosacea and other skin disorders. Water. The middle layer is mostly water with a little bit of salt. This layer, produced by the tear glands (lacrimal glands), cleanses your eyes and washes away foreign particles or irritants. If your eye produces inadequate amounts of water, the oil and mucus layers can touch and cause a stringy discharge. Mucus. 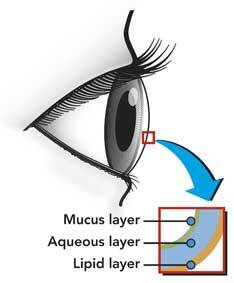 The inner layer of mucus helps spread tears evenly over the surface of your eyes. If you don't have enough mucus to cover your eyes, dry spots can form on the front surface of the eye (cornea). By staring at the computer/TV and not blinking enough, a large surface area is presented to the eye, which creates significant loss of tears. The cause here is NOT the loss of the tear production capacity, but the habit which creates significant loss of tears. Working on a computer, reading and driving at night can contribute to hyper-stressed tear film states due to insufficient blinking frequency. The human tear film is typically described as having mucin, aqueous and lipid components. At a more complex level, the tear film is composed of electrolytes (e.g., sodium, chloride), antioxidants (e.g., vitamin C, glutathione), anti-infectives (e.g., lactoferrin, lysozyme), immune and inflammatory proteins (e.g., sIgA, IgG, IL-2), proteins involved in tear-film maintenance (e.g., lipocalins, mucins), proteins involved in corneal wound healing and maintenance (e.g., fibronectin, TGF-alpha, insulin), neuropeptides (e.g., calcitonin gene-related peptide, subP) and lipid components (e.g., wax esters, cholesterol esters).2-4 These tear-film components originate from a variety of sources, including the lacrimal glands, ocular surface cells, nerve endings and meibomian glands. The concentrations of these components vary drastically from one tear film to another, and deficiencies in an individual’s quality or quantity of the components can lead to dry eye. Artificial tears help reduce dryness which seems to be the major cause of the severely gritty and painful sensation inside the eyes. Increase in blinking is crucial (at least once every 5 seconds – the normal adult blinks once every 2-10 seconds; while staring at a computer this can drop to 2-3 times a minute (Wiki). I've definitely noticed that I don't blink enough. I was watching someone in a bus today and found she blinked every second, almost. Clearly I blink much less than needed. Opthalmologist said my eyes were dry. The method(s) used in diagnosis (Schirmer Lacrimation Test and also Corneal Staining with Rose Bengal or Lissamine Green) reflects the understanding and experience of the doctor. Tear film instability is the major factor in producing the symptoms. Crucial to diagnosis and treatment is the determination of the tear film break-up time. Identified properly, it is the most revealing method, not only of the condition, but also its cause. Are able to form a continuous tear layer over the ocular surface including the damaged epithelium. May have high oncotic pressure capable of dehydrating injured water-logged epithelial tissue to normal level. May contain polar lipids at low level to strengthen the lipid layer of the tear film. Note: My eye specialist DID NOT test for dry eyes which was very obvious. According to him finding the right solution is more important. This is due to the use of anti-histamines. Apparently eyestrain will not permanently damage the eyes or cause a loss of vision. However, it can be very uncomfortable and lead to a loss of productivity. Anyone who uses a computer can take measures to reduce eye discomfort. The good news is some strains and pains can be temporary and can be resolved with rest and simple techniques and possibly medication.